The series of YouTube movies found here aims to learn to use gCADPlus landscape design software on a real job, through a series of ‘how to’ movies. 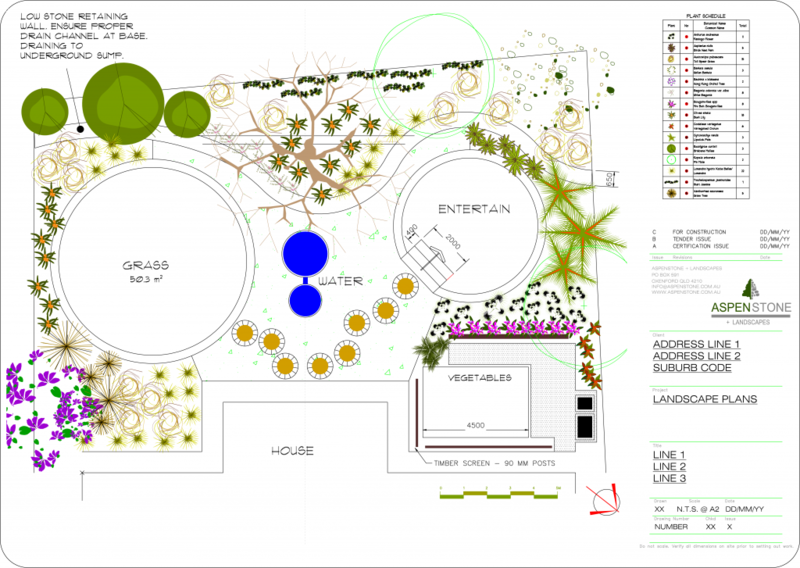 The lessons conclude with the printing of the professional landscape CAD plan shown below. These tutorial are for gCADPlus users working in the metric environment. If you are working in the USA where feet is your base measure, please visit the gCADPlus USA site. Tip: When drawing the footprint of the house, the ‘mud map’ distances used are 6000 units [mm ] across, 3000 units up, 7000 units across, 3000 units down, 8000 units across and an arbitrary length for the last segment. This movie shows how to draw the footprint of a house. When finished, make sure that you save the completed drawing as you will need it for Lesson 2. Tip: When entering values 0,0 for the first point, do not try and type in the command area at the bottom of the screen. Just click in the black screen, type zero from the top row of the keyboard, a comma, a zero and hit enter. Then pull away to the right. You should see the line drawn in red. Tip: Although you may see dimensions in the movie, you see that we erase those. We will leave a discussion of applying dimensions till later. If you would like some feedback after you have completed this first task, save your drawing and send a copy of it as an attachment to an email to info@designcad.com.au. Please tell us something about you and your learning experience while carrying out this exercise. Lesson 2: Locate the position of an existing tree. Here is a movie covering lesson 2: The house footprint has been drawn and we’ll imagine that there is a tree on the site some distance away from the house nearer the back boundary. Set out the position of a retaining wall across the back boundary of a site.